For many years we have been greedily accumulating Achievement Points with the sole purpose of waving them around and using them as a means to act superior to other gamers when someone with a lower score does better than you in Halo. Some of us have asked, however, “Why don’t we get free things for all of these points?” Well, now you can! SO, SO MANY THINGS! You’ve been faithfully building your Gamerscore for years now. To reward you for your dedication, we’ve created MyAchievements for Xbox LIVE Rewards Gold members. The MyAchievements level that you earn – CONTENDER, CHAMPION OR LEGEND – depends on your Gamerscore. The higher your score, the bigger the reward! You might notice that there are a lot of asterisks on these things, so let’s try and figure those out. ** You must have and maintain an eligible Xbox LIVE Gold membership and the applicable Gamerscore for the appropriate tier by the first of every month in order to be eligible. 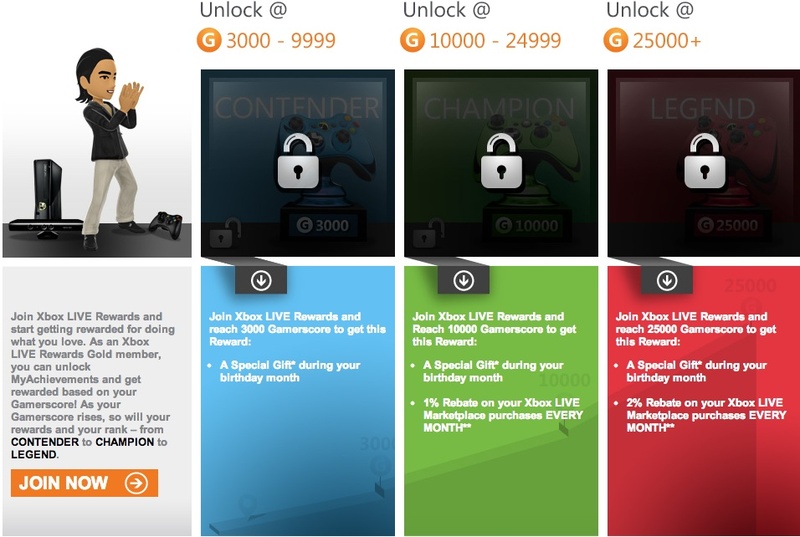 Limit: Up to 30,000 Microsoft Points can be earned per account for the entire Offer Period. Please see Terms and Conditions for details. So, if you make it to the first tier, you get a reward worth a quarter, whatever that might be. I am going to assume it is an avatar item like a birthday party hat. The Marketplace rebates are interesting, and welcome, although as a Champion, you will have to purchase seven titles at $14.99 from the Marketplace to get back just over a dollar in rebates. I don’t want to sound like I am complaining, because any rewards are better than no rewards, but if you really want to hit that Legend status, you will have to get 1000 points in 25 games (most likely even more games since we usually don’t get all the achievements, but ideally) for that 2% rebate. If these are games that you have bought, you have just paid $1,500 for a prize worth a quarter and $.30 back on the average downloadable title. Granted, there are other ways to get gamer points (the main Rewards site has some offers every month), but still. So what do you think? Are these rewards something worth getting excited about, or should we be excited simply that they exist?